Congratulations India on winning the 2011 Cricket World Cup! Like every Indian cricket fan, I wanted the Indian team to win the World Cup. Like every optimist, I knew they would. And like every food-lover I wanted to celebrate with something delightful. When India was steadily marching towards victory, I sneaked into the kitchen for a few minutes. At the risk of missing out on a few amazing overs, I went ahead and made these irresistible goodies, because I wanted to relish them as India was celebrating. 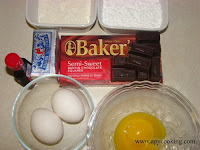 [I used Baker's semi-sweet chocolate squares. Each square weighs 1 oz, so use 4 squares]. Preheat the oven to 425 ºF. Liberally grease the bottom and sides of four ramekins or oven-safe custard bowls with butter or cooking spray. 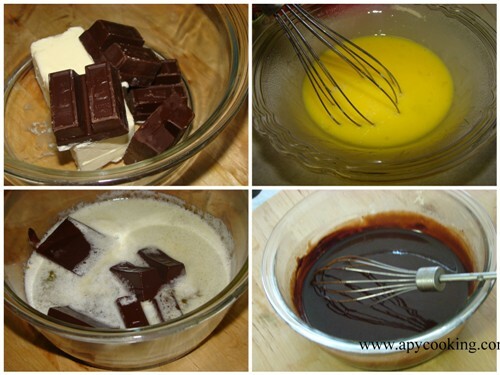 In a large microwave safe bowl, place butter and chocolate and microwave on high for 1 minute. Meanwhile, with a fork or whisk beat the eggs and egg yolks together. Remove the bowl from the microwave. The butter would have melted, but not the chocolate. 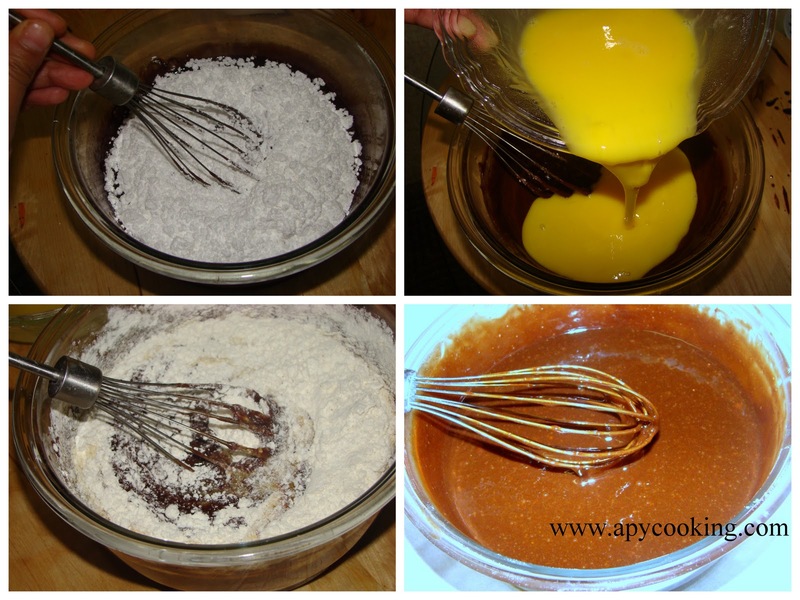 Mix thoroughly until the mixture is smooth. To this, add powdered sugar and stir well. Add the eggs and vanilla and mix. Add flour and mix until everything is incorporated. Place the ramekins on a cookie sheet (baking tray). 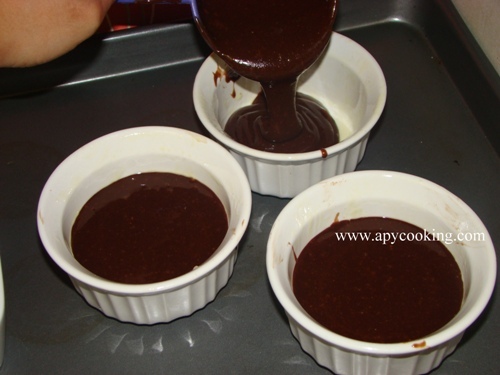 Pour half cup of batter into each ramekin. Bake for 12 to 13 minutes. The sides should be done, but the center should be slightly jiggly. Do not cook the centers completely. If you do, you will not get the molten center and the cake will be like any other muffin. The original recipe asks you to bake for 13 to 14 minutes but mine took 12 minutes. Also, the baking time depends on the size of the ramekins/ cups. I used 7 oz ramekins and 1/2 cup batter in each. You could also use a muffin pan to make these. If you are using less batter, reduce the baking time. Remove from the oven and allow to cool for a minute. Run a butter knife or back of a spoon around the sides of the ramekins to loosen the cake. Invert onto the serving plate. ... pour a dollop of slightly melted ice-cream on top. Enjoy the sinful pleasure. 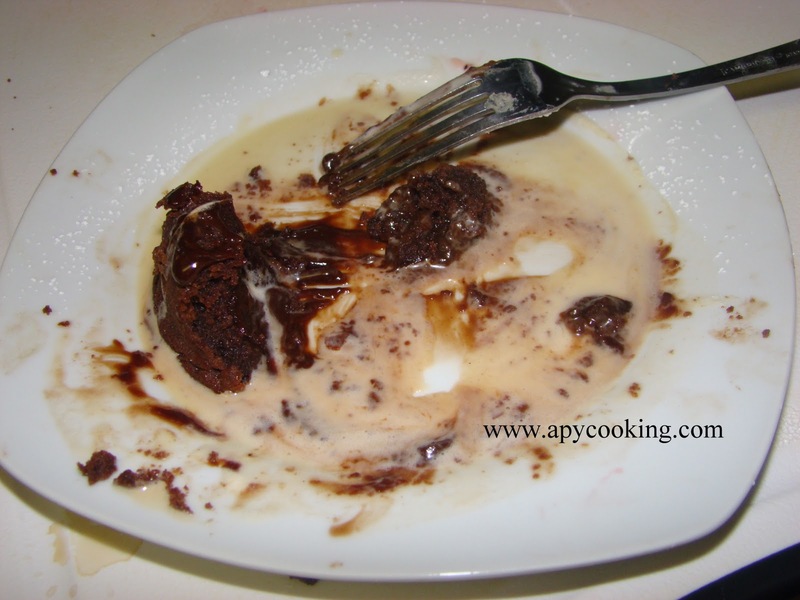 When the Indian team lifted the World Cup, my husband and I celebrated by devouring the seeping lava of this luscious volcano cake, splashed generously with good old vanilla ice-cream. Pure bliss indeed. These go to Hearth and Soul. oh!! I'm drooling over the goey n chocolatey center.. 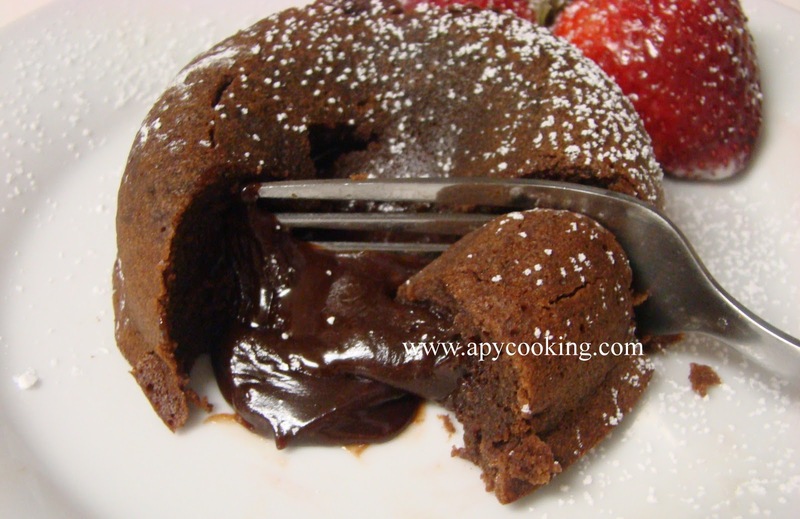 Perfect for celebration..
Chocolate lava is perfect for the great celebration !! Very tempting and yummy !! We are the Champions dear! 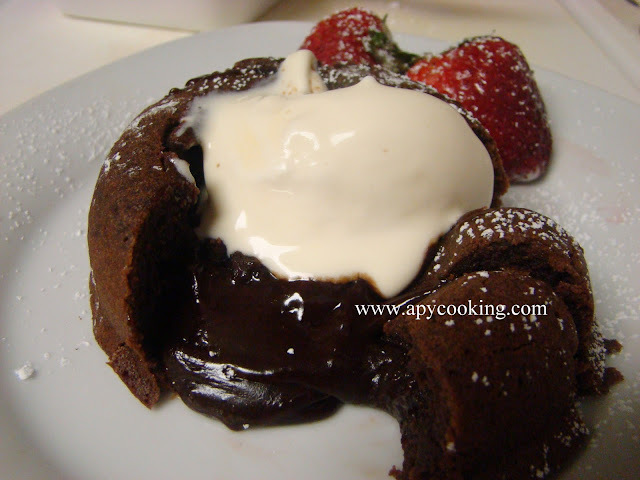 Your lava cake looks amazingly delicious. Very apt for this huge celebration. 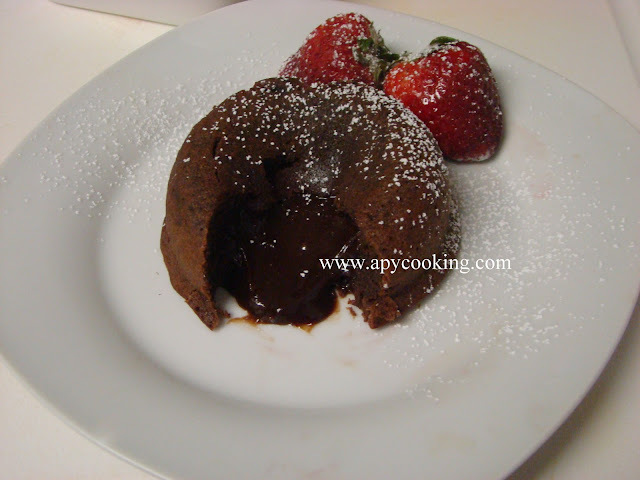 We are the champions, indeed wat a great match...Lava cake looks super delicious,prefect bake to celebrate this wonderful match..
have been craving for chock the whole day this killer...oh yum! Bookmarked rightaway... Absolute bliss indeed... wow..
Congratulations to the India team on their win! And what a fabulous celebration treat - your Molten Chocolate Lava Cake looks just mouthwatering! Thank you for sharing your recipe with The Hearth and Soul Blog Hop. Hi Apy! Congrats on the cricket win! My mum is English and so I am familiar with cricket and know how important it is to win the World Cup! What a lovely way to celebrate with these super decadent chocolate treats! I am not much of a sweets person, but I would certainly LOVE these! Thanks so much for sharing with us on the hearth and soul hop! All the best, Alex p.s. I am now following your blog!